I own a store on the ocean and this is one of my best selling products year in and year out. I don't know what I'd do without you guys. Your company never lets me down. We gave out these bags to all of our customers as a thank you for using our business. Everyone loved them. Thanks again. This bag is very spacious. Placed an order for a massive amount of these bags for one of my upcoming conventions and it was the first item I sold out on. Thanks CEP for the great investment. This bag is very durable and can hold a lot more weight than you'd think. Doesn't get better than being eco-friendly and long-lasting. Great company. I'm in charge of lunch for elementary school students and parents were interested in these bags for their children for lunch time. I purchased these and handed them out to all students who attend the school I work at. Great job CEP! Purchased these bags for my company event! They were a major marketing tool! Thank you Custom Earth Promos! I own a store by the beach this is my #1 Seller! Ordered this for our wilderness club. It was a great way to promote and the customers loved them. Great to use as a giveaway at an outdoor event. We sent this to all of our business partners and customers as a thank you for there business the whole year. The bags came out great and our logo looks fantastic. I love these bags! They capture attention of everyone. Great way to promote our business. I'm so happy with our bags. The insulation works wonderfully and our logo looks beautiful. We reorder this bag all the time, I use it as a giveaway to all our clients and personally we use it to carry bottles and cans of sodas in between bars at our events. It is very durable and can hold alot of weight. 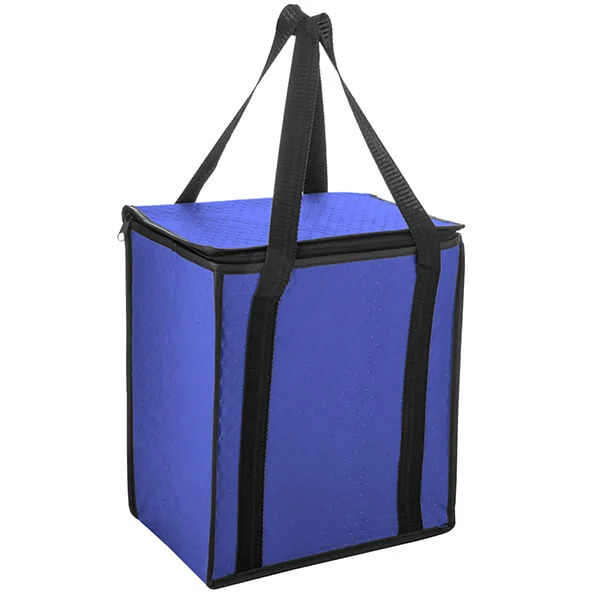 I suggest this cooler bag if you have a need to carry alot of items it is tuff and lasts long. This is the perfect bag for our business. It's extremely spacious and can carry heavier items. The large size of these bags is perfect for my customers. Thanks CEP! This is such a great marketing tool. We have no complaints! These bags are wonderful! We will definitely be ordering more in the future! We were in need of a eco-friendly bag as we wanted to present our company in a "green earth friendly light" This bag was perfect for us. All the customers received it well and it gets used constantly. I love ordering products online and this website is easy to use. I order from them all the time for my business. we did a rush order and received our bags when we needed them. Only complaint is the zipper did not work on some of th bags. Not bad though for over a thousand of them. Sturdy good looking bag. I use it all the time. This is a nice cooler bag. Good value for the price. Tons of uses, It was a great buy for my company. All of our clients loved receiving this as a gift. Big bag you can fit a lot of heavy items in this bag. My customers love to use it for large loads. These bags are GREAT! Thank you CEP, for a great promotional product! We ordered a white bag with black trim.. It looks sharp, we also did a black imprint. I recommend this color combo for your needs. We used this a giveaway promotional item for our corporate golf tournament. 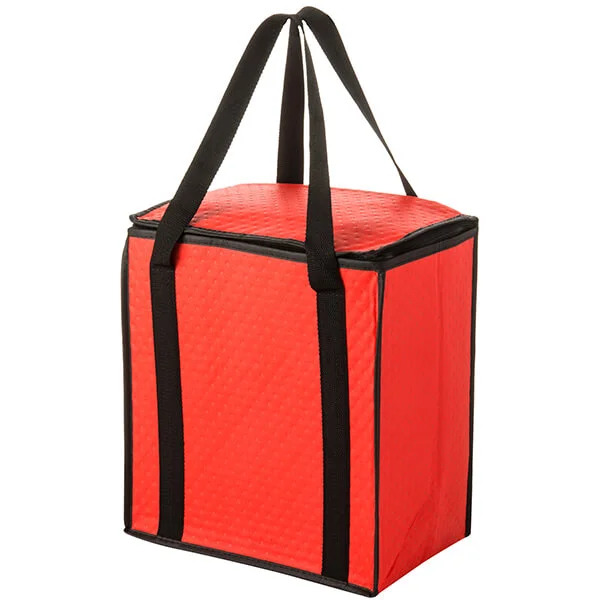 The Large Promotional Cooler Bag from Custom Earth Promos is an attractive, eco-friendly product that will keep your customer's groceries the right temperature for hours! Large Promotional Cooler Bags from Custom Earth Promos are an attractive and smart way to show your customers you care about the environment. Set an even better example by donating your customized insulated totes to those who forget to carry them to the supermarket. You can spread the reach of your brand and earn appreciation for your thoughtful method of business promotion. It's easy to decorate your Large Promotional Cooler Bags from Custom Earth Promos, as they come in one of four attractive bag colors and can be imprinted and delivered in as little as 1-2 weeks. The colorful and innovative design of these reusable insulated cooler bags is sure to capture attention, and all eyes will be on your brand name. Educate others about going green and spread the reach of your business at the same time! 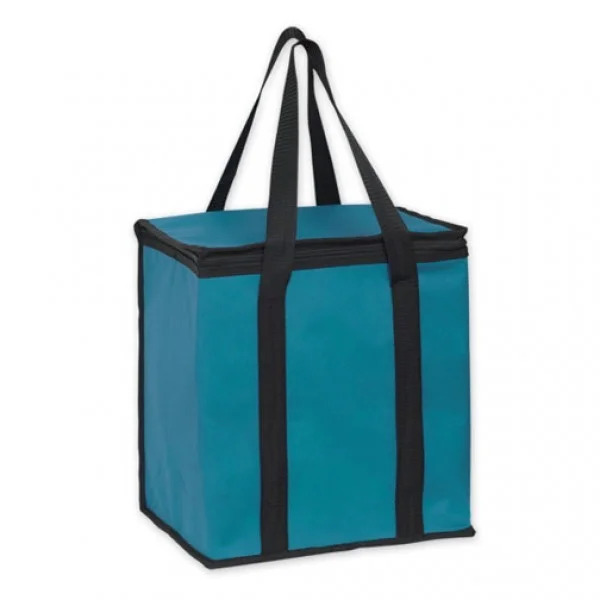 The Large Promotional Cooler Bag is produced by combining a water-resistant, non-woven polypropylene exterior with an insulted coated thermal interior. The resulting fabric is thermostable and can be recycled and reused for years to come! The bag has a large 4" W x 8" H imprint area with single or multicolor printing to add your brand name, logo, and any message of your choice for brand promotion. You can also choose different attractive combinations of colors and customize the decoration on the bag for an impressive visual appeal. Its 238 gram material is highly durable and has excellent resistance to abrasion. This tote is also resistant to many chemicals, bacteria, fungi, and algae, thus making it safe for consumables. 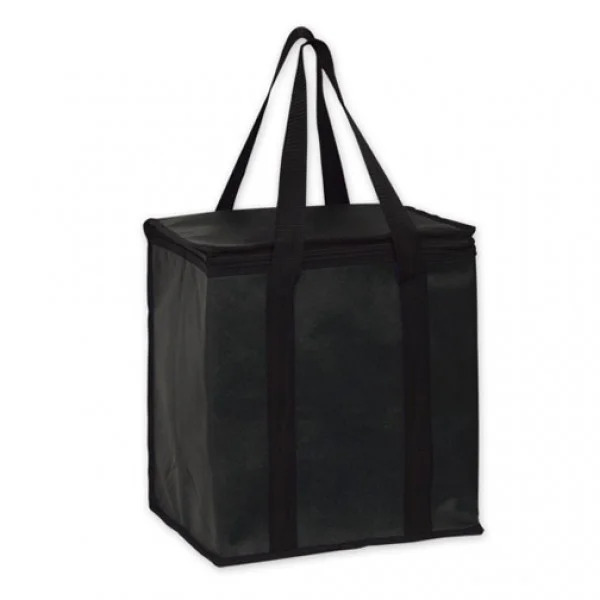 The Large Promotional Cooler Bag has extra-reinforced woven straps that are sewn down the entire length of the bag adding to the structural integrity, while also helping to carry heavy items. It can also be zippered completely closed to protect the internal contents. It has good insulation to preserve the heat (or chill) of the food. Custom Earth Promos follows all the regulations of the US Environmental Protection Agency, and all our products are kid safe and California Proposition 65 compliant. Custom Earth Promos has a custom production factory to fulfill wholesale orders at minimum costs. We have excellent personnel on our graphic design team who attend to even the smallest detail specified in your order. We offer high quality products that are long-lasting, strong, and do not suffer wear and tear from rough use. All our services help you to spread the word about your business in an environmentally-friendly method. Our prices are the cheapest available in the industry, guaranteed. 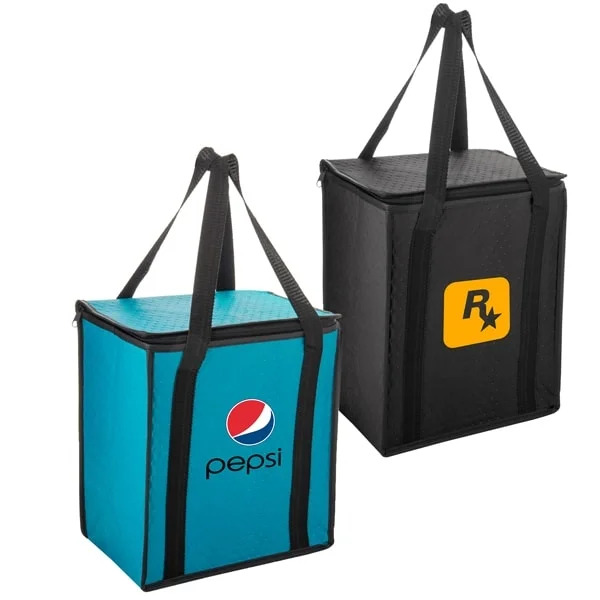 Order Large Promotional Cooler Bags from us today!